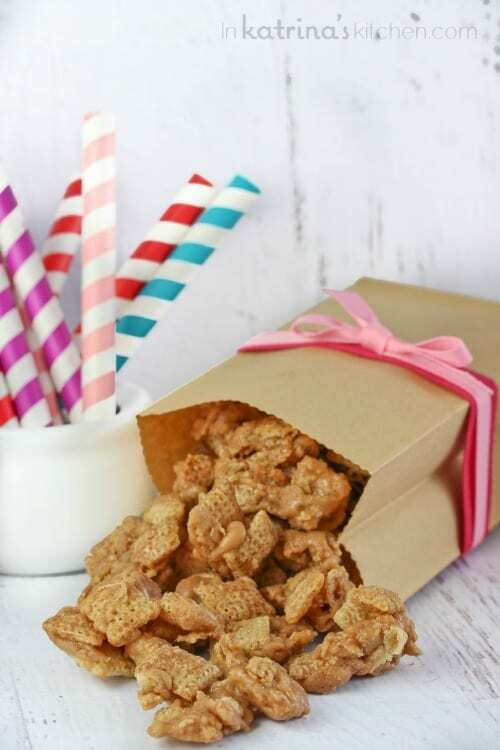 Cinnamon Cereal Toffee Crunch Recipe- enjoy it with festive M&Ms or plain. Either way it is addicting and EVERYONE will be asking for the recipe. TRUST ME! Hello. My name is Katrina, and I am addicted to making toffee. Seriously. It has been a delicious few weeks at my house. I’ve been pouring toffee over ALL THE THINGS. Valentine’s Week in a house full of boys is always interesting, especially if you are the only girl and the only person who likes pink things. I remember when my oldest was in preschool (preschool!) and he was horrified that I suggested decorating his Valentine’s card box with monsters that had hearts with them. Eww Mom that is SO uncool. No boys like hearts. No hearts. No pink. Red is pushing it (unless it looks bloody). Not even with cute monsters. And even though the monsters are cute you must not even THINK about using that word in front of your boys. So now I just let him give whatever completely manly Valentine’s cards he wants, and he gets to decorate his box with foil and burlap. He really wanted to throw some mulch on top but I had to draw the line somewhere. Sometimes just for fun I like to make delicious snacks decorated in pink and red. 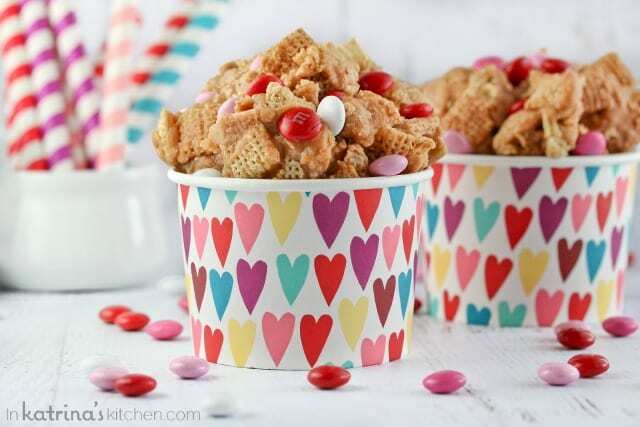 I serve them in tiny paper cups plastered with hearts, then I laugh at my house full of boys while I eat an entire batch of toffee in one sitting. Measure out the cereal. Pour in a large bowl, set aside. Immediately remove from heat and slowly add vanilla- being careful to avoid any splatters to your skin. Stir for a few more seconds, and pour over the cereal. Stir the toffee to coat the cereal as best you can then spread the mixture onto your prepared baking sheet to cool. Add M&Ms if desired. Store in airtight container for up to 1 week. This looks seriously dangerous!! Loving this fun snack! Oooooooh this is SUCH a tasty idea! I love toffee and I love cinnamon cereal! so good! 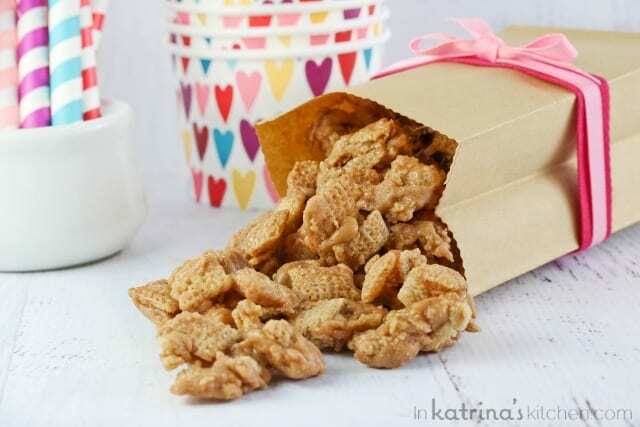 Love love this cereal treats! So adorable!! Pinning! This sounds seriously addicting! Love those heart cups! I love all things toffee flavored, want this! Can we all agree that Cinnamon Toast Crunch is the best cereal ever?! Mmmm this looks so good. You are preparing me now for Valentine’s filled with no hearts and pink (my boy is due next month)! lol. “Toffee over all the things…” OMG! Heaven is in your kitchen!! THAT is the bestest cereal on Earth! You can come to my house and serve up a cutesy Valentine’s Day spread any day. 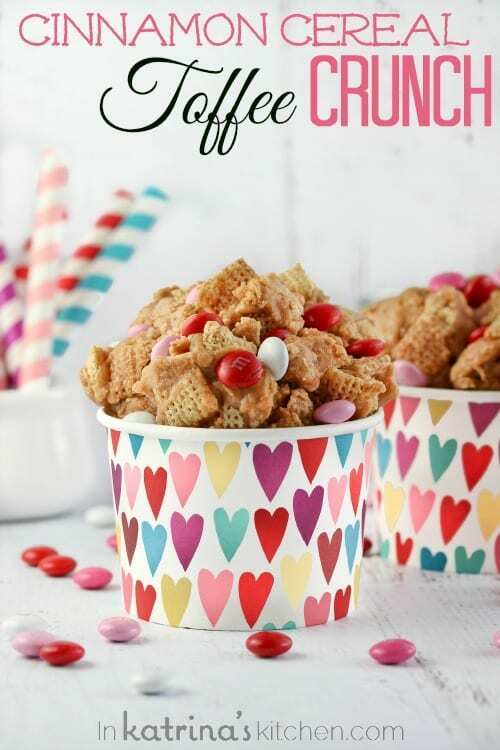 I love this snack mix, and toffee needs to happen in my house more often. Pinning! Yes once you start making toffee it’s hard to stop 🙂 Thanks for stopping by Jennie. Hi! This looks so delicious! I have made a few of your other recipes lately and they are so good! I was wondering if I could use some of your recipes and photos in a school project. Thanks! Of course- thank you for asking. I just ask that the watermark stays in tact. Thank you! I just made this to give as gifts for the holidays and it is amazing. I LOVE IT. Thank you so much for sharing! I gravitated towards this recipe because it was the simplest one I found in the BEST way possible. Thank you, thank you!